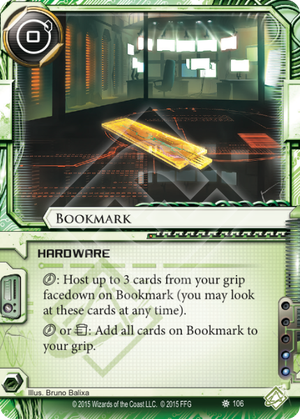 click: Host up to 3 cards from your grip facedown on Bookmark (you may look at these cards at any time). click or trash: Add all cards on Bookmark to your grip. So at first i was not sure what to make of this but now I think it can be a valid alternative to Plascrete Carapace that has some limited use outside of meat damage matchups. You can use it to store cards for later use on it and it also works against a Ronin or other net damage kill combos that need more than one click to pull of. The backside is that you still lose the cards and you do not want to many cards on it since you get them all at once. All in all I will at least try it out as a plascrete alternative that lets you get rid of useless cards without trashing them. The best use for this card in my mind is to help leverage Game Day. Dump cards you want later onto Bookmark to get full value out of Game Day. Due to the click-intensity of these two cards, this may work best in a Comet build, perhaps with Prepaid VoicePAD. Hayley Kaplan: Universal Scholar may like this card as a pseudo-Street Peddler to trigger her ability off mid-run Clone Chip and Self-modifying Code installs.